A. P. Low to join his government expedition on the Neptune. 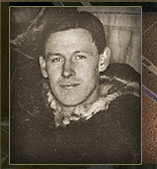 While wintering over on the Neptune in Cape Fullerton on the West Coast of Hudson Bay, Borden made a survey of diseases among the Inuit in the area, especially with regard to cancer, syphilis and tuberculosis. 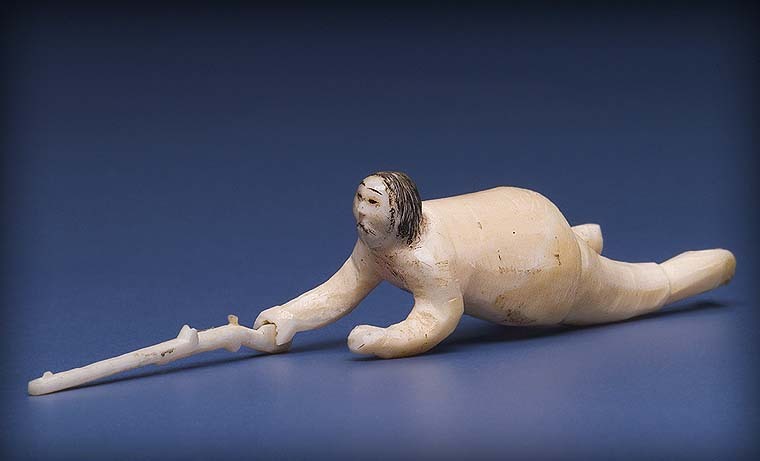 He acquired a small collection of ivories and other artifacts, often through gifts from Inuit whom he had treated. 2000  "Harry Teseuke, Captain Comer's Mate: Historic Ivories at the Canadian Museum of Civilization, part II." Inuit Art Quarterly 17(4): 44. The signature "Harry," in brown ink on the belly of this piece, allows us to attribute it to Harry Teseuke, Comer's chief Inuit collaborator. On January 13, 1904, Borden notes in his diary: "Harry, native, made me a few figures from ivory." 2002  "Harry Teseuke, Captain Comer's Mate: Historic Ivories at the Canadian Museum of Civilization, part II." Inuit Art Quarterly 17(4): ill. p. 45. A hunter, stalking a seal, is caught at the moment he approaches it, while the animal takes a nap on the ice. This kind of sealing was done in the spring. The hunter mimics blowing, and other noises made by the seal, in order to lull the animal into a sense of safety. 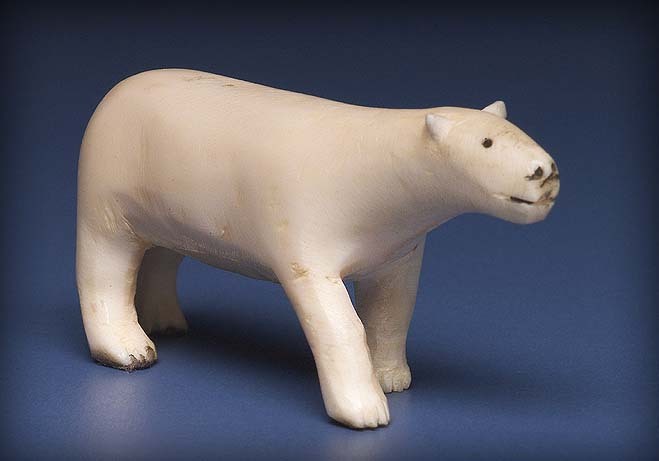 1967  "A Retrospective Glance at Canadian Eskimo Carving." Beaver Magazine. Autumn 1967, ill. p. 11. 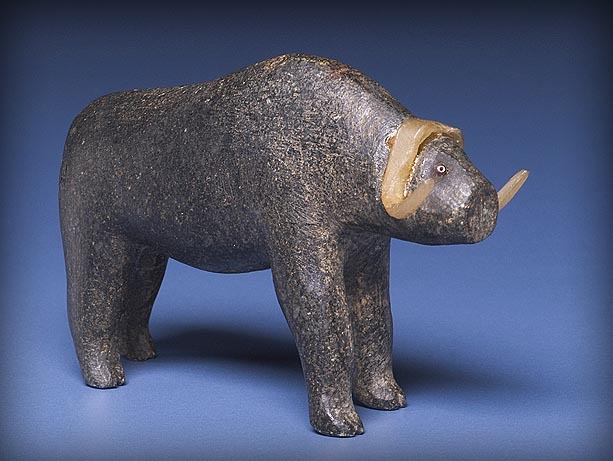 Stone sculpture seems to be rare during the historic Inuit art period. Judging by other collections, such as those of Leden and Hawkes, stone sculpture was more prevalent on the West Coast of Hudson Bay. 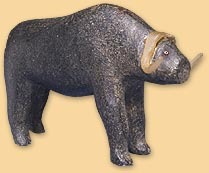 There are two stone musk oxen in Borden's collection. Arctic Mirror. Canadian Museum of Civilization, Hull, Quebec, January 25  September 9, 1990. No catalogue. 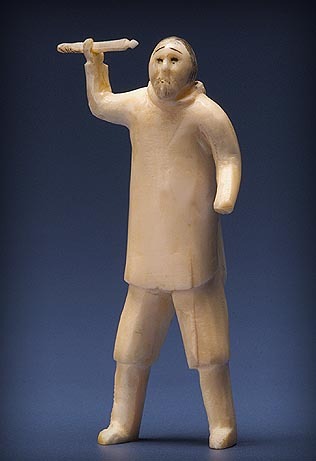 Sculpture/Inuit: Masterworks of the Canadian Arctic. Organized by the Canadian Eskimo Arts Council. Vancouver Art Gallery, Vancouver, B.C. , November 9  December 9, 1971; Le Grand Palais, Paris, France, February 10  April 2, 1972; Nationalmuseet, Copenhagen, Denmark, April 26  May 28, 1972; The Hermitage, Leningrad, Russia, June 29  July 23, 1972; Pushkin Fine Arts Museum, Moscow, Russia, August 10  September 10, 1972; Burlington Gardens Museum, London, England; October 5  December 10, 1972; Philadelphia Museum of Art, Philadelphia, U.S., January 24  March 4, 1973; National Gallery of Canada, Ottawa, May 17  June 17, 1973. Similar to pieces in Low's collection, a hunter is shown in action, at the moment before he is ready to throw his spear. 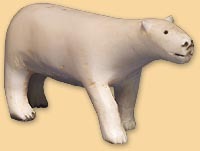 To capture a person's posture while in motion is unusual in this period of historic Inuit art. This figure presents a much greater challenge, and demands greater skill, than the stiff, motionless figures found in other areas. 1999  "A Few Things in the Way of Curios: Historic Ivories at the Canadian Museum of Civilization." Inuit Art Quarterly 14(4): ill. p. 32.